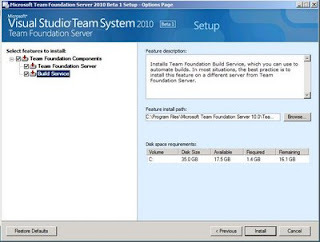 The installation of Microsoft’s latest beta release of Team Foundation Server 2010 has apparently been quite a hot topic in IT lately. My Twitter page isn’t that popular and when I first started tweeting my progress, shortly after I was receiving messages regarding my documentation and progress. Here is the shortly awaited documentation on what I’ve done to install TFS. There are a few ways this environment can be changed around (which versions such as Enterprise or Standard can be used). Check out Microsoft’s TFS installation documentation for this information (a convenient .chm file…​check my blog post on this if you have issues opening this file). Additionally, this post documents a single-server installation on a 64-bit machine. Here’s a summary of the order of software installation that will be taking place. If it isn’t obvious yet, this is going to be a long post. I’ve taken screenshots of many of the steps which won’t help the length. Is everyone buckled in? Good. Let’s get started. The install of Windows Server really isn’t that complicated. There are not special requirements for this. However, post-install, my server was added to a domain so I could use domain service accounts. It isn’t necessary to have the server added to a domain though. This part really isn’t too bad (thankfully). 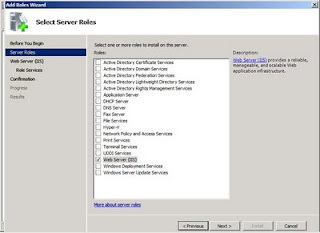 In the server management, on the left click Roles. On the right, click Add Role Services. Here some default values are selected. You need to add HTTP Redirection, ASP.Net, Windows Authentication, and IIS 6 Management Compatibility and all subordinate check boxes. Click Next. Here your selections are reviewed. If everything is correct, click Install. Once the install has completed, you’ll see another review window. If everything was successful, click Close. Here’s where the real fun begins. This install isn’t too bad. The real ticket is to know if you have any service accounts you want to use for the SQL services. Since I did a single-server install on a server dedicated to my team, I used NT Authority/Network Service for mostly everything, but I’ll get to that a little later. First off, insert the SQL installation media (I used an ISO file mounted through Hyper-V for mine). From here, run the setup executable on the disk. Mine did an autorun. From that window, I selected installationon the left navigation pane. On the screen that loads on the right, select New SQL Server stand-alone installation or add features to an existing installation. The screen that comes up will run five tests. If your installation is clean than most likely all five will pass with a green check mark. Mine threw a warning to me on Windows Firewall because mine was turned on with default settings. Since the server is behind two firewalls, I elected to disable the Windows firewall completely. Re-running the test after that resolved the warning. Click Okay. Here we are at the obligatory Product Key screen. Enter your product key and hit Next. If you accept the license terms (License Terms page), check the box and click Next. The next screen wants to install setup support files. Go ahead and click Install to continue. The following screen will yet again, run some more tests (eleven to be precise). Again, if this is a clean install, every test should pass. Here’s one of the crucial screens: . 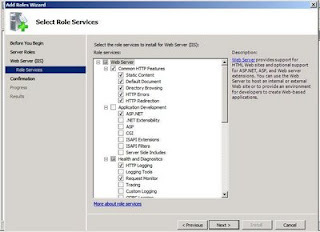 On this screen, you should select to install *Database Engine Services (for TFS), Full Text search (for reporting), Reporting Services (for reporting), Analysis Services, Client Tools Connectivity, and Management Tools Basic. Once those are checked, click Next. Hit Next to continue to the * screen. If you want to, you can rename this SQL instance to whatever you want it to be. I chose the default MSSQLSERVER since it will be used for TFS only and nothing else will be connecting to it. Click Next. Click Next on the *screen. Here we are at the Server Configuration section. Unless you have any specific domain accounts set up for running SQL, NT AUTHORITYNetwork Service will suffice for all of the accounts listed. No password is required to use this username. 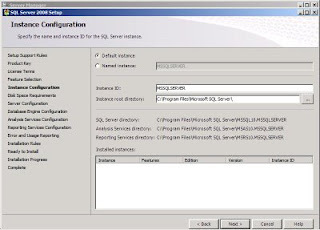 Also be sure to change SQL Server Agent to start up automatically (by default it is manual). Click Next. The Microsoft documentation suggests on the Database Engine Configuration page that Windows authentication mode be checked. I have had some pretty nasty experiences with this in the past and selected Mixed mode authentication. Following this, you need to type in a password for the SQLSA user. Also, don’t forget to add all of the users you want to have access to the DB engine. Once you’re done with that, click next. The next page is the Analysis Services Configuration page. Add any users you want to have access to the analysis services that your SQL instance will supply. Click Next. On the Reporting Services Configuration page, select Install the native mode default configuration. Click Next. Here’s the obligatory Error and Usage Reporting screen. Check whether or not you want Microsoft to receive anonymous usage statistics regarding your SQL instance and click Next. Nearing the end, click Next on the Installation Rules screen. Once the installation is complete, click Next and Close. Here we are at the final software install. This part really isn’t too bad (surprisingly enough). To begin, insert the installation media (once again, I mounted an ISO through Hyper-V). If autorun is enabled, a standard window should come up giving you the option to explore the newly inserted media. If this does not happen, just open up Computer and navigate to the disk. Inside the disk there are three folders. Depending on your processor architecture, choose either the TFS-x64 or TFS-x86 folders. From within that folder, run the Setup.exe file. Here we’re at the first screen. Click Next to proceed. Once again, the ever-present Licensing Terms page. If you accept, check the box and hit Next. 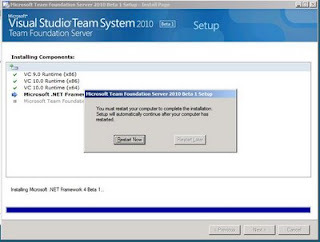 The Microsoft documentation suggests that only Team Foundation Server be checked. I actually need the build server to be on the Team Foundation Server as well so I checked all three. Either will work though. Click Install. During your installation, the server will need to be restarted. Click restart now. Upon restart, the configuration option will become available to you. Pat yourself on the back. You just installed TFS. This is a long enough blog post for now. I’ll post here very shortly the configuration steps I took for TFS (still haven’t taken all of the screenshots I need for it).